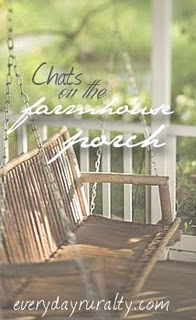 Breathing in Grace: Chats on the Farmhouse Porch!! Chats on the Farmhouse Porch!! I've been kinda busy and haven't joined Ms. Patrice and the other ladies on the porch lately....but thought I would this week!!! Sorta, kinda....we actually went to Cracker Barrel for lunch. Pappy bought me a beautiful African Violet and a sweet card....oh, and my little stuffed owlie (yes, I'm big kid at heart!!). Then, we kept our GRANDsons in the evening so that our daughter and "son" could go out for supper!!! What was the last craft item you made? Would you believe that there is rarely a day that goes by that I'm not working on something? I have several orders for some of my crocheted items and I've been working on those....plus all those other "work in progress"!!! Are you planning a garden? Are you swamped with seed catalogs? We have a small vegetable garden every year. This year, we don't plan to do as much as we did last year....just maters and cukes and green beans....and flowers in the containers!!! Just lipstick....I'm a pretty simple gal!!! I love the outcome....but the process, not so much!!! So looking forward to seeing what the rest of the ladies have to say!!! Your Grandsons are precious. Boys will be boys.